First Name Speed…Last Name Racer. Where I will do my best to present talking points and avoid singing along the way. Here he comes, Here comes Speed Racer. Hey, thanks for the heads up song writer. That’s not ominous at all. He’s a demon on wheels, He’s a demon and he’s gonna be chasin’ after someone. Let’s break that down. A “Demon on wheels;” Well, that is a thing we say about people who are driven. However, the second mention of demon is not qualified with any sort of type. Which leads me to believe that this song is implying that Speed Racer is an actual demon. Well that changes things. 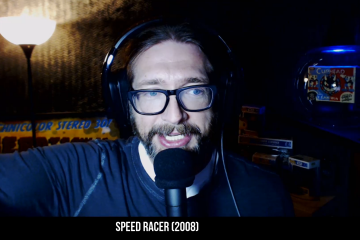 Oh what did you do Papa Racer!? He’s gainin’ on you so you better look alive. Holy crap. The “chasin’ someone” is now no longer in question. It’s “you” who the demon racer is chasing! Also, there are rumors circulating that Speed Racer lures little kids and monkey’s with Candy into the trunk of his car! You nothing but evil Speed Racer! He’s busy revvin’ up a powerful Mach 5. Speed Racer, Will see it through. A Life wager! Nope! Nuh uh! Nope! Go Speed Racer! Go Speed Racer! Go Speed Racer, Go! Straight back to hell ya doe eye’d demon! Randy, what movie did you watch?